MSV: Grist for the Mill: Where in the world is former Mayor Dawn Zimmer? Grist for the Mill: Where in the world is former Mayor Dawn Zimmer? Hoboken's former Mayor Dawn Zimmer has exited stage left. She announced her shocking plan last June to opt out of seeking a third term to tackle global warming climate change, a central prog religious tenet of hers. However, no plans announced to take up residence in China and India and face down the biggest producers of energy by-products have followed. She's merely "gone away" not much unlike her once formidable rival in the fourth ward Chris Campos. Rumors for months among people privy to the small insider network around her say she's leaving Hoboken. So far, no one is committing to say where. Her college age boys are more independent and the family business was sold after the passing of her mother-in-law leaving no significant ties to remain in the Mile Square City. So what's next for the former Hoboken mayor? 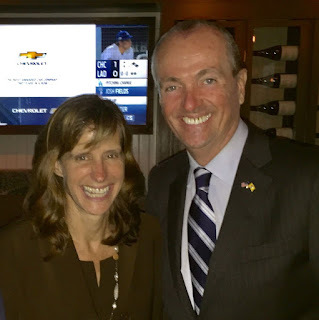 Many have been awaiting an appointment for her in the new Phil Murphy administration where her former Chief of Staff landed but no announcement has been forthcoming. There's curiosity if Dawn Zimmer would face down the daily southern Hoboken traffic jam she constructed on Observer Highway as part of a weekly commute to Trenton. Those in the know doubt she'd inflict such a demanding commute on herself. More likely they say is a quiet exit to a destination unknown as she decompresses from two demanding terms as mayor. Zimmer's first term was met with plots to undermine her and stop progress or decent governance at every turn. With efforts to close the hospital where the City was saddled with $55 million bond guarantees to refusals to make simple end of year line item budget transfers; she was opposed by a vicious Old Guard council faction. A five member majority council coalition held for most of her first term and part of a second term delivering success after success until she alienated her council allies completely, detonating the Reform Movement in the process. So what's next? Perhaps Phil Murphy will carve out a green czarina position where Zimmer can be a roving NJ ambassador for efficient light bulbs. Or something. Everyone will have to wait a little longer and see where the former Hoboken reform advocate goes. Dawn Zimmer was not contacted for this grist column. She stopped responding to MSV as soon as she executed and announced the back room deal to withdraw from re-election and install Ravi Bhalla in her place last June.